The Architect Sir Christopher Wren is buried in London’s St Paul’s Cathedral and his tomb has the inscription – “Si monumentum requires, Circumspice” which means “If you want (his) monument, look about you.” For the new St Paul’s, replacing the old one burned down in 1666 is all Wren’s own work. 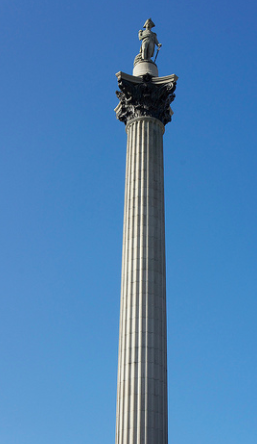 The Great Fire had spread from Pudding Lane, and there still stands “THE MONUMENT” a pillar also designed by Wren. It commemorates the Great Fire and for about 150 years it was inscribed with the allegation that the fire had been deliberately started by Roman Catholics. I do not know what Inquiry or Tribunal, if any, came to that conclusion, but the poet Alexander Pope (himself a Roman Catholic) described the allegation, in verse, as a lie. Eventually in the 1820s the inscription was removed. While it lasted the Church of England had a monopoly of power in England. Did all its Bishops and Clergy believe the allegation. Did some disbelieve it but keep silent for the sake of their livings. Or was there debate? It would be nice if someone with a knowledge of Anglican politics could enlighten us. We know of many cases of miscarriages of justice which have dragged on for decades lest important personages are exposed as humbugs and worse. The statue of Admiral Lord Nelson in Trafalgar Square has given rise to controversy recently, but it seems reasonable to me that if a Square must be named after his most famous battle, only appropriate that his statue is central to it. His mortal remains lie in St Paul’s near those of Wren, after a sea voyage pickled in a barrel of Brandy. Perhaps a fitting answer to the old question – “What shall we do with the drunken sailor? On a more serious note I do object to a statue in Trafalgar Square of Nurse Edith Cavell, which bears the inscription — “PATRIOTISM IS NOT ENOUGH.” For those who had the statue erected, Patriotism, Chivalry and Honour had to be dishonoured and Almighty God blasphemed. The word went out from British Government directed propagandists that Edith Cavell, a British Nurse in Belgium was merely tending to the wounded and that her shooting by the Germans was contrary to the rules of war. Within months they wey were boasting that the German “atrocity” was worth a number of Army Corps to the British forces as chivalrous youth in their tens of thousands joined up to punish the Huns. The Church of Englan One hundred years after the shooting of Edith Cavell, in October 2015 the former Director of MI5 Dame Stella Rimington revealed that Edith Cavell had in fact worked as a spy and that her execution by the Germans conformed to the rules of conduct recognised by all the belligerents. Devil a bit of good to the chivalrous dupes who had died in their tens of thousands for one lie. One lie among many still told by Britain’s propagandists. The Church of England posted Edith Cavell in its Calendar of Saints. A sainted spy. What next – a Sainted Informer?